Mozilla Thunderbird is an open-source, free and cross-platform mail client and news reader for most modern operating systems including, Windows, Macintosh and Linux.It’s now easier to organize, secure and customize your mail with Mozilla Thunderbird 2 email client.It provides the ease of light weight offered by web mails, and competes with industry standards like Microsoft Outlook in advanced features. Thunderbird is a desktop email client, that can be configured to access POP,IMAP, and even Microsoft Exchange Server provided email accounts. Thunderbird 2 includes many new features to help you manage your inbox. 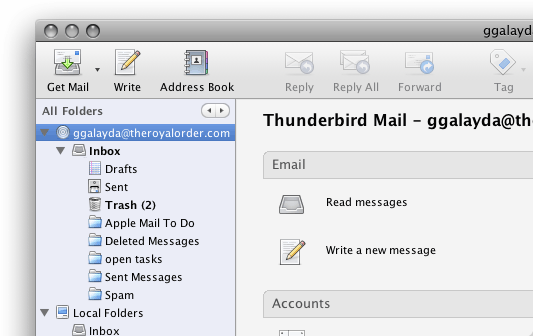 Simple to use, powerful, and customizable, Thunderbird is a full-featured email application. Thunderbird supports IMAP and POP mail protocols, as well as HTML mail formatting. Easily import your existing email accounts and messages. Built-in RSS capabilities, powerful quick search, spell check as you type, global inbox, deleting attachments and advanced message filtering round out Thunderbird’s modern feature set. With Thunderbird 2, it’s easier to prioritize and find your important email with tags and the new find bar helps you find content within your email faster.